Our Monroe traffic ticket attorneys speak with clients on a daily basis answering their questions regarding Union County traffic violations. Some of the most common questions are found below. All cases are unique and for specific questions reguarding your case please contact us at your convenience. . The law requires individuals who received speeding tickets at specific speeds to appear in Court. This is a mandatory appearance. There is an exception to the law, wherein a qualified attorney can appear on your behalf. To qualify the client must sign a waiver of appearance which allows the attorney to appear for you. Yes. North Carolina’s laws regarding speeding are very punitive and can result in your driving privilege. Our Union traffic attorneys can walk you through the court system and will put you in the best position to keep your license. Further, we will explain how we can save your insurance from a significant increase. The most candid answer is that it depends. There are a number of factors which go into whether your home state will become aware of your Union County traffic ticket. With the proliferation of computer technology more and more DMV’s can share information which means even old tickets are showing up in your home state’s DMV. As such, we counsel our out of state clients to assume that the ticket will appear in their home state and the best course of action is handling the Union traffic violation. Starting January 1, 2012 North Carolina implemented a new law which requires police officers to arrest any 16 or 17 year old who carries a learner’s permit or a provisional license if that person is charged with a criminal moving violation. There is no exception noted in the statute. Further, there is an automatic license suspension for thirty days regardless of whether the teen is ever convicted of the offense. While this law coverage moving violations like DWI DUI it also includes speeding over 15MPH over the speed limit or going over 80MPH. In general the answer is no but there are exceptions depending on the severity of the mistake. There are different types of notice requirements depending on the type of case. For civil cases service must be personal with specific requirements about identity, location, time etc. For traffic tickets notice only needs to provide the bare bone facts. It is not uncommon to have mistakes about time, road name, or driver’s license number. By themselves none of these would be fatal. However, there are instances where the ticket is invalid on its face. Therefore it is in your best interest to have the ticket reviewed by one of our traffic ticket attorneys. To answer this question we would need to know the speed of the ticket, the driving record of the defendant, and the driving record of members of the household. Finally, with all of this information the way the ticket is handled will determine the effect on your insurance. Insurance rates are set by the North Carolina General Statutes. As such, our NC NC traffic lawyers will be able to tell you what you are facing and what we can do to avoid insurance increases. For more information on this subject please see our article on NC Speeding Tickets and Insurance. There are different racing violations so it depends on which violation you were cited with. There is a risk of losing the vehicle if you were cited with prearranged racing. For more information on this subject please see our article on North Carolina Racing Violations. In the long run you will be better served to have the knowledgeable Union traffic lawyers of Rosensteel Fleishman, PLLC handling your speeding ticket or other traffic violation. Our lawyers are able to walk you through the process from start to finish and make the difficult and potentially expensive situation easier for you, your family, and your wallet. 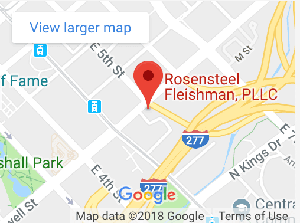 Our commitment to client service and efficient, effective legal representation is why Rosensteel Fleishman continues to be the best. If you have any questions please contact us to discuss your ticket.